IM: At 36km on the bike McKenzie is now leading McNeice by 1.30, with Brown and Cunnama a further 5.30 back. 70.3: Appleton continues to lead at the 4km mark 2.32 ahead of Alexander and Reed. IM: 2015 IRONMAN Australia champion Michelle Bremer has stormed into the lead at the 36km mark. Blatchford is staying with her, while Crawford is falling back. IM: The Nesbitt brothers are all out of the water, Peter in 1.21, Mick in 1.24 and younger brother Troy in 1.18, as they say "it's on like donkey kong." 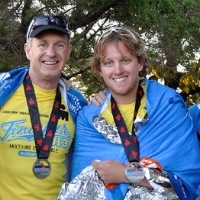 IRONMAN.comThe annual IRONMAN Cairns and IRONMAN 70.3 Cairns have many stories of endeavour. Daniel Hoy talks to one of them. 70.3: Caroline Steffen leads Annabel Luxford off the bike and onto the run. Her lead is just over 2 minutes. 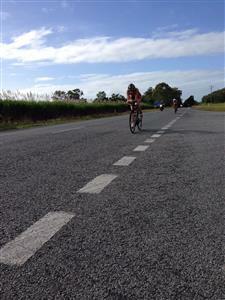 70.3: At 7km Appleton still leads by 2.32 to Reed and Alexander, all three are currently running 3.25 per km. IM: Bremer and Blatchford are now 45 seconds ahead of Crawford. 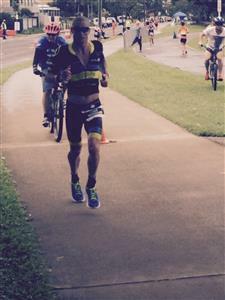 70.3 Early into the run and Steffen's lead is now over 3 minutes. 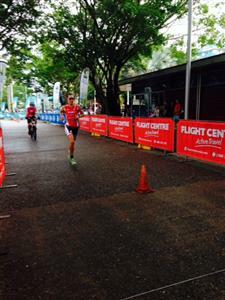 70.3 At the 12km mark Appleton is extending his lead over Alexander and Reed who are now 2.49 behind. IM At the 43km mark off the bike McKenzie leads by 2.07 to McNeice, with Brown and Cunnama over 5 minutes back. McNeice did what he expected to leading out of the water. Here's what he said about his race plan when we spoke to pre-race. 70.3 At the 5km mark Steffen is running ten seconds a km faster than Luxford. IM: Puching back into a head wind McKenzie still leads from McNeice with Cunnama and Brown in 3rd and 4th. Out spotter reports that McKenzie's cadence is around 95-100 with Brown and Cunnama at 85-90, all three look comfortable, McNeice looks to be hurting the most. 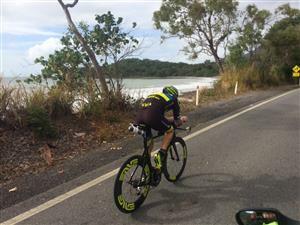 IMCairns update - Just past the 60k mark on the bike, McNeice has dropped back 4:27 from McKenzie. Cunnama has now dropped Brown who has fallen 6:25 behind. 70.3 and Appelton has 1km until he takes the 2015 IRONMAN 70.3 Cairns title! Sam Appelton has won the 2015 Flight Centre Active Travel IRONMAN 70.3 Cairns! Unofficial time is 3:48:54. Craig Alexander has broken away from Tim Reed just in time to enjoy the home stretch into second place of the IRONMAN 70.3 Cairns. 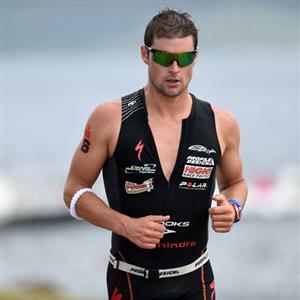 Tim Reed, Sam Appleton's coach, has finished in 3rd place in the 2015 IRONMAN 70.3 Cairns. IMCairns update from the bike course at the 83k mark: McKensie is looking fresh in first leading 5:42 on Cunamma who has leaped over McNeice into second. Brown is holding steady in 4th but has been reported as looking calculated and collected. This just in from the IRONMAN Cairns women's race, Blatchford is making her move to drop Bremer after making the turnaround at the 75k mark. Crawford is reported in 3rd 2:10 behind. 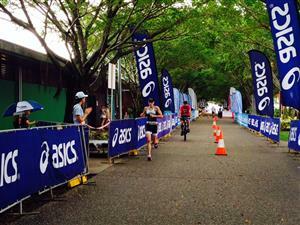 It appears that Beth Gerdes has dropped out of the IRONMAN Cairns women's race. She was reported to be saying that her legs "just can't do it" 5k into the bike. Cunnama has dropped his chain on the IRONMAN Cairns bike, so has fallen back into the pack of Brown and McNeice. The men are out of Port Douglas leaving blue skies behind and heading into 30k/hour winds with strong gusts at the open spots of the course and rain fall in Cairns. Our spotters on course had a chat to the guys. Luke is claiming to feel alright in front and does not appear to be faltering any time soon. Cunnama is frustrated that he lost the lead off of Brown and McNeice and the ever professional legendary Cameron Brown does not seem phased that he is over 7 minutes behind the leader. Brown is a proven strong runner, but at the rate McKenzie is pushing a fast marathon is not guaranteed to push Brown into claiming IRONMAN Cairns for the second consecutive year. Beth Gerdes is confirmed to have dropped out of the IRONMAN Cairns race. On the 110km mark of the #IMCairns women's race, Liz Blatchford is putting the pedal to the medal to build a large leader gap in front of Bremer. 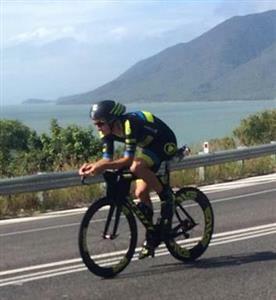 Blatchford has caught up to the top age group athlete, Clint Kimmins - it appears the sky is the limit for our two x IRONMAN Cairns women's victor. At 133km on the bike McKenzie still leads from McNeice, Brown and Cunnama all over 10 mins back. Luke McKenzie is increasing his lead on he bike, here's what he had to say pre-race. At 133km mark of the bike Liz Blatchford is extending her lead, she's now 7 minutes ahead of Crawford, with Bremer a further 2.30 back. As the women near the end of the bike leg Liz Blatchford has a 5.10 minute lead over Crawford, with Bremer 7.35 down. At the 133 mark Simon Billeau was 12 minuts off the lead in 7th, he made his way through the field to exit T2 11 minutes behind McKenzie, and one minute behind ahead of Brown in third. At the 6km mark of the run Luke McKenzie is leading by 11.20 to Simon Bileau and Brown at 12.15. Our spotter reports that Brown looks the better of the two. Our female spotter Amanda Balding reports that Liz Blatchford smashing the back end of this bike, her lead is now over 10 minutes as she closes in on T2. 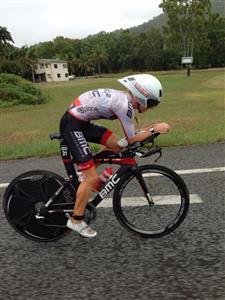 Liz Blatchford is onto the run, she's got a big lead over Gina Crawford who is still on the last few kms of the bike. Cameron Brown is now in second place and running well. Early into the run Blatchford's lead over Crawford is just on 7 mins with Bremer 3rd a further 4 mins back. At 14km McKenzie still leads Brown by 11.57 with Billeau a further 3 min back in 3rd. Between the 4.5km and 7km mark Blatchford's lead over Crawford was 6.19. According to our spotter both girls are running well. McKenzie is holding onto the lead and running well. He's holding 4.30 per km.